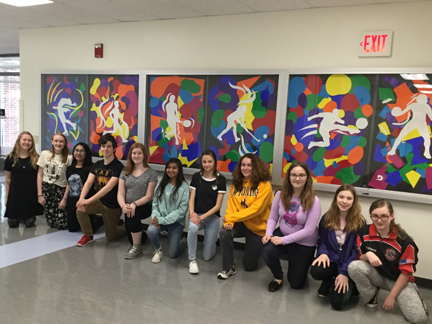 A group of 6th, 7th, and 8th grade students collaborated together to create an art display in the Middle School front lobby under the direction of Mr. Madonna. The artwork was created using the collage technique with cutouts from painted paper. Not Pictured: Sammy Barley, Emily Cutman, Colin Kirkpatrick, Emma Ross, Karley Schneck, Ana Soto.